Vemana Institute of Technology, Bangalore has advertised in the DECCAN HERALD newspaper for recruitment of Teaching Faculty- Professor / Lecturer / Principal Plus Non-Faculty jobs vacancies. Interested and eligible job aspirants are requested to apply immediately from 06th June 2018. Check out further more details below. About College: KRJS laid its foundation in 1925 with the sole aim of catering the educational needs of all sections of society.Till today it continues to carve excellent niches in the minds of aspiring students. 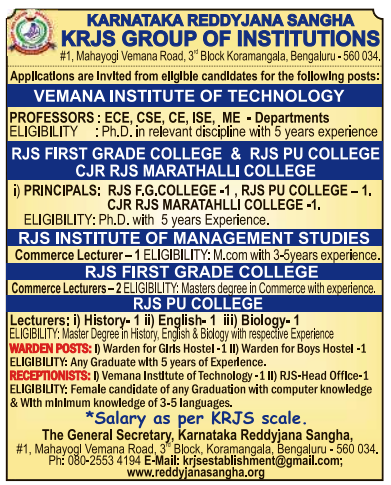 KRJS now flourishes with 12 educational institutions spreading its colorful wings all over Bangalore. Imparting 'VidyaDaana' by meditating on the slogan 'VidyaSarvasya Bhooshanam' taken from the golden hymns of our Vedas, we elate our glory by adding various discipline starting from Pre-Nursery to postgraduation courses including technical courses.